Aerial Animals straps have a cotton cover and integrated nylon fiber core. The cotton provides comfort and the nylon provides strength. The standard aerial straps are 2 inches wide (1/8" shrinkage on dyed straps) ​and certified Minimum Breaking Strength 2900 lbs (see certification document below) which makes them a great beginner or conditioning strap. Straps are a soft good and should be retired after two years or 1500 hours of use: Read the "Know Your Straps" section below before making a purchase. Current liability insurance through Borden Perlman. Aerial Animals has made straps since 2013. Our webbing manufacturer quotes a 2400 lb breaking strength. The seams stitch pattern is designed to support 3200 lbs. In 2016 our straps were certified at 2900 lbs. See certification document above. January 2014, destruction tests produced the following data: The cotton covering started to break around 1200 lbs and the nylon started to fail around 1700 lbs. The nylon stretched about 12 inches before any of the nylon fibers broke. Catastrophic failure did not occur. Test results showed the dye did not affect the breaking strength. In 2015, a test was conducted a set of straps which were heavily used for performing and teaching for over two years. These also failed between 1700 and 1800 lbs. In August 2016, a set of straps which were used for over 3 years in studio conditions were tested. 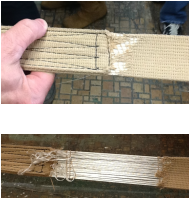 These straps showed excessive wear with much of the cotton cover worn away and the nylon fibers exposed and flattened. In test conditions, the straps stretched over three feet before the nylon fibers started to break at 1200 lbs. Again no catastrophic failure. Note that these destruction numbers reflect a single strap not a set of straps. Equipment life expectancy - Retire straps after two years or 1500 hours of use. There is no industry standard regarding when to retire straps and it is important to realize that straps are a soft good (i.e. ropes, silks) and need to be replaced more frequently than hard goods (i.e. lyra). Factors which affect the safe, usable life of your straps include the age, frequency and intensity of use, the environment in which they were used, and how they were stored. In most industrial applications and sports like rock climbing, best practices recommend retiring soft goods after five years regardless of signs of wear. There have been no reports of Aerial Animal strap failures. But the 2016 test data shows the properties of the nylon core in Aerial Animals straps degrade after two to three years. This destruction data has been shared on this website and included with all strap shipments and invoices since 2016 which is when Aerial Animals first obtained the data. You rely on your straps and don't have a backup. A new set of straps every two years is a good measure of personal protection. ​Care: Inspect your straps before each use looking for signs of the cotton cover tearing, thinning of the material, or loose stitching. If you see any sign of the cotton tearing as in the photo above, quit using the straps immediately regardless of the age of the straps. Note: the nylon provides the structural integrity and the cotton cover provides comfort (much like a climbing rope with core and sheath). Even though the cotton doesn't affect the overall strength, it is still an indicator of wear. The straight seam at the bottom is cosmetic and not structural. The criss-cross seams provide the structural integrity of the seam. If your straps are fraying at the end, trim the loose threads and use a seam sealant like Fray Check to secure the edge. Store straps loosely coiled in a place with some circulating air. You can and should wash your straps. It will extend the life of the straps. If they have been dyed, the color may bleed. Wash your straps in a bucket of warm water with detergent and rinse well. Hang to dry with weights on the ends to even out the straps. You can wash the leather reinforcements on the ends. Do not use Aerial Animals straps for dynamic drops or dislocs since the current strap MBS is 2900 lbs. Consider using a bungee pack or rigging from a pulley system to reduce the impact of the forces generated verses a dead hung system. The current Aerial Animals strap is for beginners and conditioning only. There have been tragic accidents on straps due to increased level of difficult tricks, lack of industry standards, using the wrong straps or old straps for higher level work, lack of user awareness or personal responsibility, and lack of basic safety procedures, None of the accidents were on Aerial Animals straps. Aerial Animals is working to produce a higher-level strap rated at 5000 lbs. Know how much force you generate in high-level moves. People can generate 4-9 times their weight or more. When someone is learning a new move, they may generate more force doing it wrong than one would expect. Be safe, be responsible, take care of your equipment, have adequate health insurance to cover a catastrophic accident and make sure your straps fabricator posts a certification documenting the minimum breaking strength. Know the limitations of your equipment. NOTE: Do not use choke loops / cinches as a safety device. An aerialist was injured because the choke loops were not properly secured and the aerialist relied on them. (Not Aerial Animas straps or cinches.) General warning. Our travel straps are made from the same webbing but have a stitch pattern designed for 2000 lbs MBS. They have not been certified for MBS and are not intended for dynamic use. They are intended to be cinched over a gym bar and used for conditioning. Let us know if you have an idea that you would like to try! Straps: $190 for 8 ft. + $5 each additional foot. See below for dying charges. Shipping is included in price for online orders. Aerial Loops: 8 ft includes the attachment loop and seam making the opening or working space on an 8 ft set of straps about 7 ft 4 inches. Custom lengths available. Add $10 per foot for lengths over 8 ft. Shipping is included in price for online orders. Aerial Animals straps are now available in scarlet red, cardinal red,oxblood red, black, deep purple, Burgundy, eggplant, red fuchsia, dragon fruit, forest green, moss green, Cerulean blue, navy, midnight blue, cobalt blue, teal blue, timber wolf grey, and potentially other colors. The base color of the webbing is tan. White is not an option. All straps are dyed by hand using Procion dyes. This is a time-consuming endeavor - plan on 4 hours minimum. I am happy to tell you how to do this yourself! $25 charge for dyeing. $35 for black and some other colors. Red, midnight blue, deep purple colors are consistent. Many of the blues like cerulean blue and teal vary in shades and uniformity when we dye and don't always look like the supplier's color chart. Colors, especially black, will fade with use. Hand-wash your straps periodically and dry them with weights hanging on them.